It is worth remembering that the above derivation is valid for both dry and moist adiabatic processes. As the parcel rises adiabatically, its kinetic energy goes up, if there is a positive area enclosed by the parcel's path and environmental curve. where we have substituted v = va - ve. We have seen that the v-p and T-lnp diagrams have the area-energy property: the area enclosed by the environmental curve on the left and an adiabatic (parcel) curve on the right is proportional to the kinetic energy per unit mass assumed by a parcel being forced upwards by buoyancy in such an unstable atmospheric profile. Figure 7.1 shows a diagram of an environmental sounding curve with a dry adiabat leaving the surface and rejoining the sounding at a higher level in the atmosphere. Theoretically, a parcel leaving the surface along the dry adiabat will have a kinetic energy on reaching the environmental curve proportional to the shaded area bounded by the two curves. Of course, the idea of frictionless motion of the parcel is highly idealized. Exchange of momentum transmitted by small eddies between the parcel and its environment tend to slow the parcel and alter its motion from the ideal conditions of frictionless motion. This entrainment process also exchanges other properties such as chemical composition and enthalpy. Nevertheless, the idealized kinetic energy parameter has proven useful in diagnosing and predicting the consequences of unstable situations. Figure 7.1 Schematic diagram of a sounding (left border of the shaded area) along with a dry adiabat rising from the surface (right border of the shaded area). The shaded area is proportional to the kinetic energy acquired by a parcel in rising from the surface to the intersection of the two curves. We will return to energetic considerations after introducing the skew T diagram and passing through a series of chart exercises designed to build familiarity with the charts. While in the previous section we saw that the T-ln p diagram has the very useful area-energy property, experience has shown that a related diagram is even more useful while preserving the area-energy property. While several such diagrams have been proposed over the years and discussions of them can be found on the internet, by far the most widely used is the skew T-log p chart which we will refer to simply as the skew T chart. Use of the diagram saves time, avoids tedious calculations, and provides an easy visual means of summarizing the vertical structure of the atmospheric thermal, stability, energetic and moisture characteristics. Data from a radiosonde (an instrumented balloon launched every 12 hours at a network of thousands of locations over the globe) are plotted on the diagram to form the sounding or environmental curve. The main parameters derived from the radiosonde are the pressure, temperature, humidity, altitude and horizontal components of wind velocity. The skew T diagram differs from the T-ln p diagram in that the abscissa is rotated about the origin (T0 ~ —50°C, ln 1000) by about 45° downwards in a clockwise direction as illustrated in Figure 7.2. Figure 7.2 In the skew T diagram the T-axis is rotated about 45° clockwise. 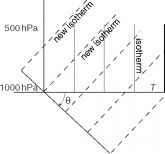 The original isotherms were vertical while the rotated ones are tilted as shown. The isobars are horizontal before and after the rotation (only the abscissa is rotated). 0.1 0.2 0.6 1.0 2.0 3.0 5.0 10.0 20.0 40.0 g/kg Figure 7.3 Illustration of a skew T- logp diagram. 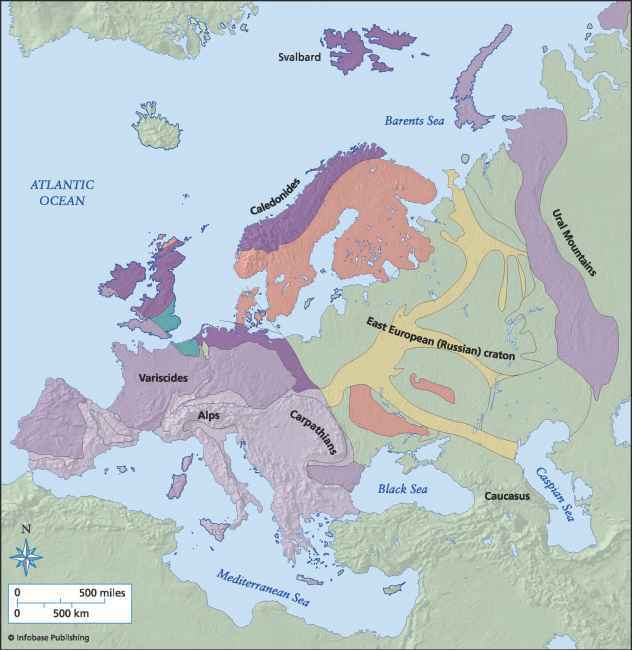 The isolines are labeled. This tells us that a closed loop in a skew T diagram has the same value as that same loop in a T-ln p (unskewed) diagram. The larger the area enclosed the more energy will be involved in a related closed loop process. The closed loop process can then be related to the conversion of buoyant potential energy into kinetic energy of convection as we discussed in the last section. In the skew T diagram the lines of constant pressure (isobars) are horizontal while the isotherms are no longer vertical but are tilted to the right. 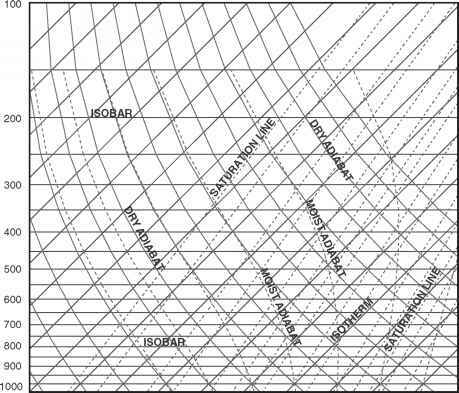 Examination of Figure 7.3 shows many lines besides the isobars and the isotherms. Let us take one curve at a time. This relationship shows that the dry adiabats are not exactly straight lines on a skew T diagram. 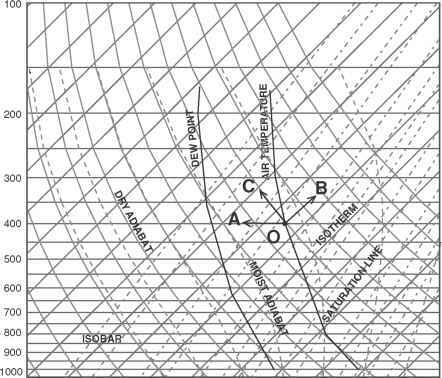 Hence, the dry adiabats are slightly curved (solid) lines which run from the lower right to the upper left of the diagram and are nearly perpendicular to the isotherms. The 45° angle between the skewed isotherms and isobars and the resulting 90° angle between isotherms and adiabats makes it easier for the observer to see the difference between the sounding and the adiabats. This property has led to the wide adoption of the skew T diagram. The pressure is in hPa (same as mb), the temperature is in degrees Celsius. The dry adiabats are labeled by the potential temperature associated with them. Saturation mixing ratio These lines are drawn on the skew T diagram as dashed lines running toward the upper right. The units are g kg-1, which indicate the amount of water in grams per kilogram of air at saturation at the particular temperature and pressure. The value for each saturation mixing ratio line is shown on the bottom of the diagram (on some charts on the internet it might be shown on the upper right). Moist adiabat These are shown as dashed lines running toward the upper left. They can be computed from the information in the previous chapter, but this is unnecessary since the charts already provide the relationship. More about these below. 0.1 0.2 0.6 1.0 2.0 3.0 5.0 10.0 20.0 40.0 g/kg Figure 7.4 Example of a sounding on a skew T- logp diagram. The thermodynamic state of a parcel of air can be represented as a point in the diagram. For example, a parcel having temperature - 10°C and pressure 600 hPa is seen to have potential temperature ~30°C. To specify the parcel's properties completely we need to know its water vapor content, w in g kg-1. Suppose our parcel which is located at 600 hPa and - 10°C contains water vapor with a mixing ratio of 0.5 g kg-1. These three quantitiesp, T, w are sufficient to define the thermodynamic state of the parcel. One could equally well specify p, 6, and RH since one triplet can be found from the other. Next consider the sounding plotted in Figure 7.4. There are two sounding curves plotted on the chart: the temperature plot and the dew point plot. Both profiles are based on radiosonde measurements. The temperature line is always to the right of the dew point line. One can read the values of potential temperature, equivalent potential temperature, saturation mixing ratio, and actual mixing ratio of an air parcel situated at any particular pressure and temperature. A parcel of air can be moved hypothetically in different directions on the chart. As it moves its thermodynamic coordinates change. For example, consider a parcel on the environmental temperature curve at 400 hPa; a horizontal move (OA) is an isobaric change (this might result from cooling due to radiation). A move along an isotherm (OB) shows how the parcel's properties change under an isothermal displacement. A move along a dry adiabat (OC) indicates the changes that a parcel would experience if it were lifted adiabatically to a different pressure level. As a parcel is lifted dry adiabatically, the chart shows that the temperature of such a parcel decreases (it crosses isotherms of decreasing temperatures). This cooling is again a graphical expression of Poisson's equation. To introduce skew T charts, let us walk through some chart exercises. Exercise 1 An air parcel has a temperature of 253 K at the 600 hPa pressure level. (a) Find its potential temperature and saturation mixing ratio using both skew T-log p chart and formulas. Answer: (Figure 7.5) On the skew T diagram that we use (see Figure 7.5), the temperature is in degrees Celsius; for that reason we first have to convert Kelvins to degrees Celsius (T = —20°C). Find the point on the diagram where the abscissa is equal to —20°C and the ordinate is equal to 600 hPa (point A). To find the potential temperature of the parcel, follow a dry adiabat to the intersection with the 1000 hPa level (point B). Read the temperature at point B. This is the potential temperature of the parcel which is equal to 293 K. To find the saturation mixing ratio, from point A follow the line with constant saturation mixing ratio to the intersection with the abscissa (dashed line). Read the value of saturation mixing ratio (1.3 gkg-1). Figure 7.5 Diagram for Exercise 1. 1 In these exercises we use reduced accuracy, Tstp = 273 K and psTP = 1000 hPa as STP except when Tstp appears in the integrated Clausius-Clapeyron equation. Using formulas, (i) find the potential temperature from Poisson's equation, (ii) find the saturation mixing ratio from the integrated form of the Clausius-Clapeyron equation (5.17) and formula (5.35). (b) Move the parcel along the dry adiabat (dry adiabatically) to the 850 hPa level. What is the new temperature of the parcel? What is the new saturation mixing ratio? What is the parcel's potential temperature at 850 hPa? Answer: From point A follow the dry adiabat to a pressure level of 850 hPa (point C). To find the temperature, follow the isotherm from point C to the intersection with the abscissa. Read the temperature (T = 7°C). To find the saturation mixing ratio, from point C follow the line of constant saturation mixing ratio to the intersection with the abscissa. Read the value of saturation mixing ratio (7gkg-1). The parcel's potential temperature at the 850 hPa level is the same as at 600 hPa, since the descent was conducted dry adiabatically with conservation of potential temperature. Exercise 2 An air parcel has a temperature of 298 K at 1000 hPa level. Its mixing ratio is 14 g kg-1. Find the relative humidity using the chart and formulas. Answer: Find the point on Figure 7.6 with abscissa 25°C and ordinate 1000hPa corresponding to the initial conditions of the parcel (point A). Using the formulas, the temperature of the parcel is known, therefore from the Clausius-Clapeyron equation we find the saturation pressure to be 32 hPa. Then, calculate the saturation mixing ratio from formula (5.35). Finally, find the relative humidity from (5.28). Exercise 3 Using the same initial conditions as in Exercise 2, find the dew point of the parcel using both chart and formulas. Figure 7.6 Diagram for Exercises 2 and 3. This gives us the dew point temperature TD = 19 °C. Exercise 4 An air parcel is lifted adiabatically from the 1000 hPa level where the parcel has a temperature of 20°C and dew point 6°C. Find the LCL (lifting condensation level). What are the temperature and potential temperature of the parcel at this level?